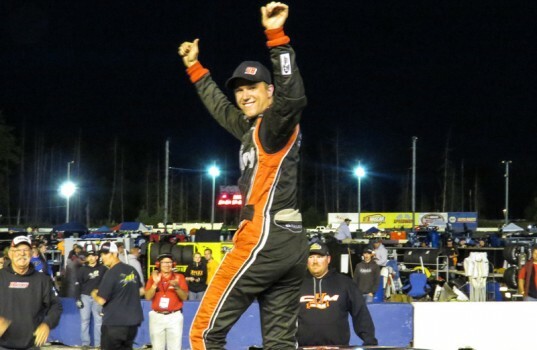 LOUDON, N.H. (September 21, 2014) –Following an impressive NASCAR Camping World Truck Series (NCWTS) debut last month at Canadian Tire Motorsport Park, Cameron Hayley made his return to the No. 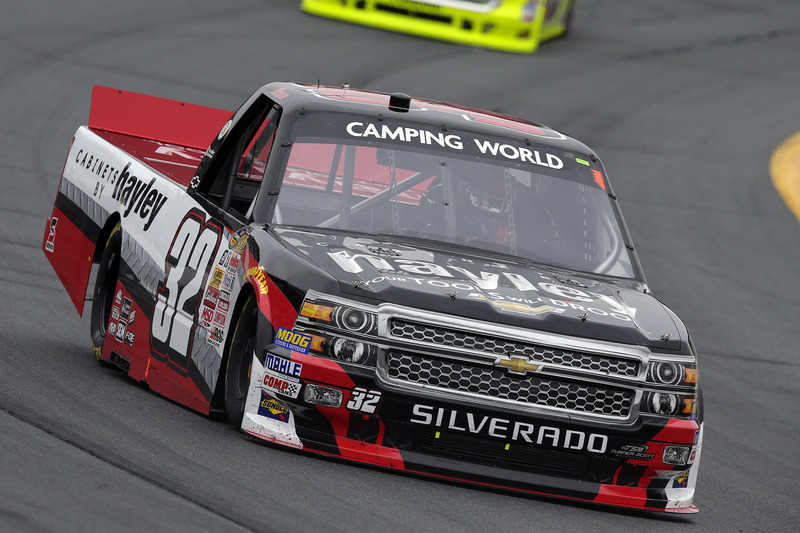 32 Cabinets by Hayley Chevrolet Silverado to take on New Hampshire Motor Speedway, finishing just outside of the top five in his second-career NCWTS start. Having only competed at the one-mile New England track in the NASCAR K&N Pro Series East (NKNPSE), the 18-year-old showed pure talent as he made his way around the loop for the first time in a truck, having to adjust not only to the truck’s handling, but also to the radial tires that the NCWTS uses rather than the bias ply tires that the NKNPSE driver is accustomed to. Hayley used the weekend’s three practice sessions to get reacquainted with the track, laying down impressive top-10 speeds in each session. In his first attempt at NASCAR’s knockout qualifying on an oval, Hayley advanced the No. 32 Cabinets by Hayley Chevy to the final round of qualifying, ultimately scoring a second-place, front-row starting spot for his Turner Scott Motorsports (TSM) team. As the green flag waved for a packed New Hampshire crowd, Hayley settled into the top five and began running the fastest lap times on the track. Two-time NCWTS championship-winning crew chief Mike Hillman Jr. called Hayley to pit road on lap 65 for a quick green-flag pit stop, giving the No. 32 truck four tires and fuel before it rejoined in the top five. The first caution of the 175-lap race waved on lap 102 and Hillman took the opportunity to bring Hayley back to pit road for four tires and fuel, while making a slight track-bar adjustment to tighten up his entry. By lap 119, the Cabinets by Hayley Chevy was once again the fastest truck on the track. Veteran NASCAR spotter Eddie D’Hondt helped the young driver maneuver his way through tight traffic before the second caution arose with 29 laps to go. Following the leaders, Hayley returned to pit road for two right-side tires and fuel, rejoining the field in the fourth position. With true patience and persistence, the Canada-native managed to hold onto his top-10 track position throughout three late-race restarts before crossing the finish line in the sixth position. Calgary’s Cameron Hayley has been steadily progressing up the ladder in the world of NASCAR, securing a ride for three races on the Camping World Truck Series this season. Cameron Hayley wasted little time kicking off his bid to one day become a famous NASCAR driver. The smoke had hardly dissipated from the candles atop his 15th birthday cake when he joined the K & N Pro Series West — in 2011 becoming the youngest driver ever to compete in a NASCAR-sanctioned event. And he wasn’t just along for the ride, finishing second in his first race. Now, just a month after turning 18, the Calgarian is joining NASCAR’s elite. On Thursday, it was announced he has a ride for three races this season on the Camping World Truck Series, starting with the Aug. 31 stop in Bowmanville, Ont. “It’s going to be incredible,” he said. “Coming from Canada, you’ve got the only NASCAR race in Canada being at Canadian Tire Motorsports Park and I get to make my debut in it. I think that’s awesome to be able to have the support of your home country in your very first race. Hayley got his start racing go-karts in Calgary when he was seven and parlayed that into jumping into a baby grand stock car when he was 11 at the Edmonton International Raceway near Wetaskiwin. At age 14, he started racing Superlight models before graduating to the minor leagues of NASCAR a year later. From there, the dreams started to become a little more realistic for Hayley, especially after he was added to the NASCAR Next program, a select group chosen by the sanctioning body that spotlights the sport’s rising stars. CameronHayley knows the Bowmanville track well and thinks his best chance will come in his debut race in front of tons of family and friends. Hayley admits it will be tougher in his next two races on the series, though, because he doesn’t know the tracks as well and considers them more challenging. “In those, I’m looking to get used to how the drivers race, how the level of competition has changed and just really get more seat time in the truck,” he said. All with a goal of possibly securing a full-time ride on the Camping World Truck Series in 2015. Pretty impressive for a Calgary kid, far from the bread basket of NASCAR’s heartland. Hayley hopes his rise inspires the next generation of Alberta drivers. “There’s always that hope,” he said. “I know I have a ton of support from my friends. They all think it’s awesome, obviously. MOORESVILLE, N.C. (August 21, 2014) – Turner Scott Motorsports (TSM) is pleased to announce that Cameron Hayley will compete in three NASCAR Camping World Truck Series (NCWTS) races this season in the No. 32 Cabinets by Hayley Chevrolet Silverado, beginning at Canadian Tire Motorsports Park on August 31. A Calgary, Alberta native, Hayley is currently competing full time in the NASCAR K&N Pro Series East (NKNPSE) for TSM and has claimed one pole award, six top-five finishes and currently sits second in the Driver Point Standings. Hayley graduated from high school this past Thursday and came to Evergreen Speedway to collect a graduation check of $21,000 after a dominating weekend at the third annual Summer Showdown. Hayley had a perfect weekend at the 5/8-mile oval in Monroe, Washington by setting a new track record in qualifying and leading every lap he event he raced in this weekend. Hayley led a total of 231 laps this weekend, 206 in the main event and 25 laps in Friday’s qualifier race. The 200-lap race was extended to 205 laps due to a late caution when Braeden Havens made hard contact with the frontstretch wall. Under the rules, the last five laps must be run under green. This didn’t worry Hayley. “We didn’t want to see that, but that is racing and I knew we hard the car to do it,” Hayley said. Hayley won $20,000 for the victory and also collected an additional $1,000 for being the fast qualifier for the event. Garrett Evans made a late race pass on Pete Harding to finish second, but knew he couldn’t catch Hayley. Pete Harding, the 2012 Summer Showdown winner, came up short on being the first two-time winner of the event. Naima Lang was fourth and Zack Beamon was fifth. Gary Lewis was sixth with Owen Riddle in seventh. Korbin Thomas was eighth and Mike Longton finished ninth. Tayler Riddle rounded out the top ten. MOORESVILLE, N.C. - Turner Scott Motorsports is excited to announce its 2014 driver lineup for the NASCAR K&N Pro Series East. Drivers Brandon Jones and Ben Rhodes, who each drove part time for TSM last season, will return fulltime with the organization, joined by newcomers Kaz Grala, Cameron Hayley and Scott Heckert. In its debut season in the K&N Pro Series East, TSM captured six wins and three poles overall en route to taking the championship with Dylan Kwasniewski behind the wheel. Kaz Grala, a 15-year-old from Westborough, Mass., is a high school freshman who has climbed the ranks in auto racing’s minor leagues while having a breakout year last season. Grala turned heads early in 2013 when he became the youngest race winner in UARA series history, taking the checkered flag at the prestigious Hickory Motor Speedway. Grala continued to place his name in the record books last season when he became the youngest driver to lead laps in the NASCAR Myrtle Beach 400 at Myrtle Beach Speedway. Grala will continue his march towards NASCAR’s biggest stage in 2014, running a fulltime K&N East schedule for TSM. A talented young racer from Calgary, Alberta, Cameron Hayley made his karting debut at the age of seven. Competing in the NASCAR K&N Pro Series West since 2011, Hayley was the youngest driver to compete in the series and finished second in his debut. Hayley was the NASCAR K&N Pro Series winner at the inaugural UNOH Battle At The Beach at Daytona (Fla.) International Speedway and finished the 2013 season with one win, six poles and a second-place finish in the K&N West driver standings. The 17-year-old is a member of the NASCAR Next program, a select group chosen by the sanctioning body that spotlights NASCAR’s rising stars. Scott Heckert, a 20-year-old Connecticut native and student at Miami University in Oxford, Ohio, began his career with success in the Skip Barber National and Regional road racing series. In 2012, Heckert partnered with championship-winning driver and team owner BJ McLeod in the Bright House Challenge Series, where he was named 2012 Rookie of the Year. In 2013, after finishing third in the Watermelon Capital Speedway SpeedFest, Heckert made his NKNPSE debut for McLeod, earning a best finish of seventh. The 2013 campaign was a busy one for Brandon Jones, who made seven starts in the K&N Pro Series East, three in the NASCAR Camping World Truck Series and nine in the UARA-Stars Series. The 16-year-old from Atlanta, Ga., will challenge for the Rookie of the Year award in the K&N East in 2014, while continuing to fine-tune his skills by running a Late Model and NCWTS entry when the schedule permits. Ben Rhodes began his racing career at the age of seven, starting in karts and winning several championship titles before moving up the ranks running Bandoleros, Legend Cars and Late Model Stock Cars. In 2013, the Louisville, Ky., native ran a partial K&N East schedule for TSM, where he made seven starts with two top fives and five top 10s to his credit. The 16-year-old is also a member of the NASCAR Next program. The NASCAR K&N Pro Series East season kicks off with the New Smyrna 150 at New Smyrna (Fla.) Speedway on Sunday, Feb. 16.